13th and North E: A Cameo Layout In Quarter-inch Scale. 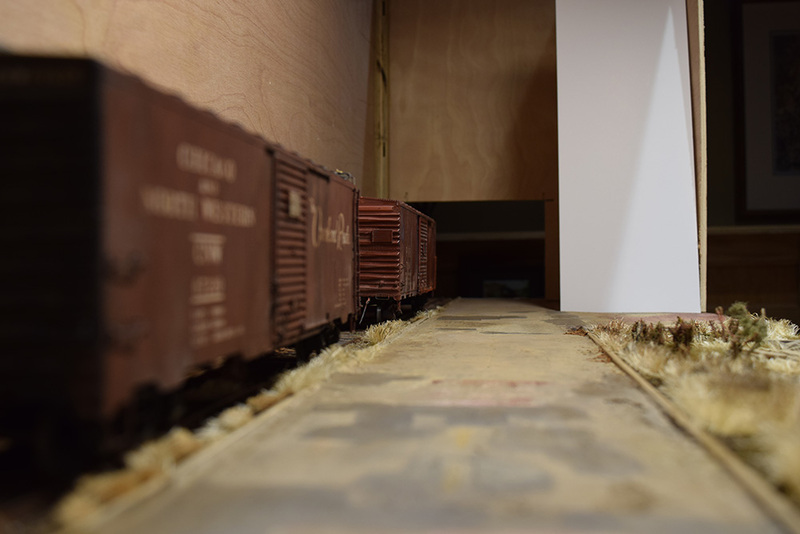 An acute issue with quarter-inch scale is fitting the layout you want into the space you have. Simply put, it isn’t always possible with the traditional vision of open country running between towns or yards. The scale isn’t HO and the compromises involved are serious and can be a deal breaker for many. I don’t have a magic wand that will universally fix the problem of too little space, though I have found a solution that works well for my needs. 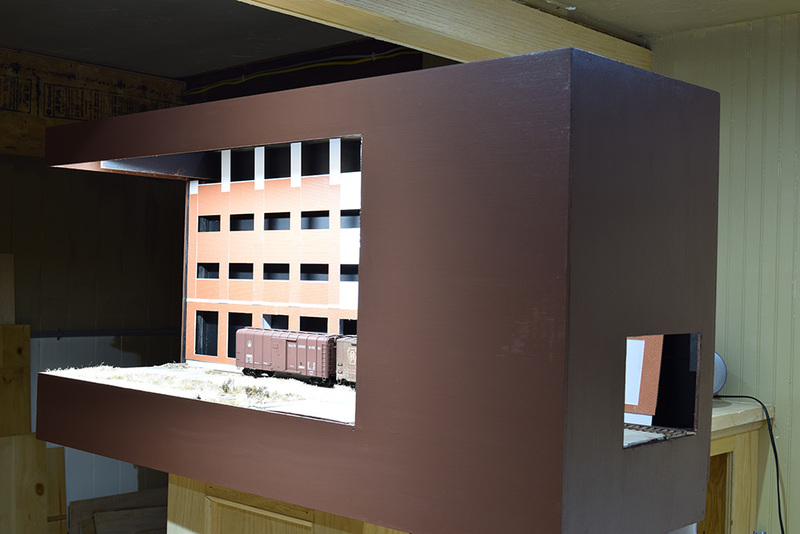 My current project is what well known UK modeler Iain Rice calls a cameo layout: a small, self-contained layout with integrated lighting and presentation. Staging can also be built-in or added in the form of a simple fiddle yard. I’m calling my effort 13th and North E: a cameo layout in quarter-inch scale. It features a simple urban setting with a rail served warehouse. 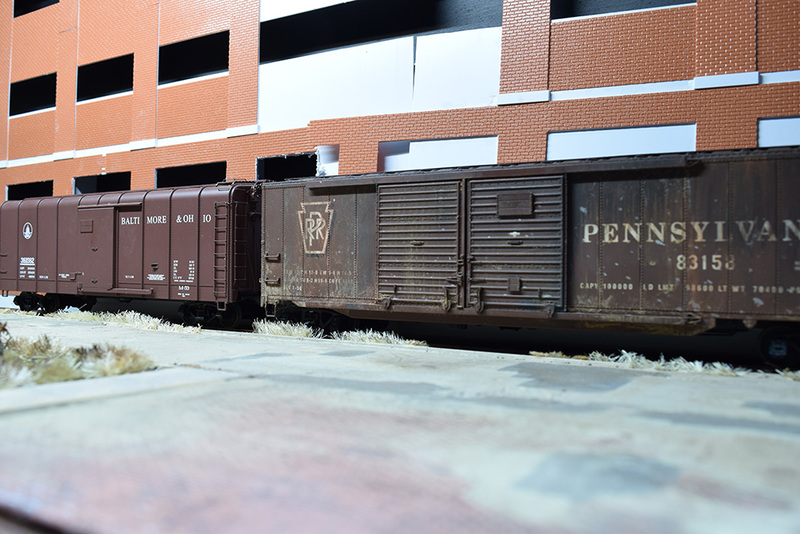 Modeled to full-scale length, the warehouse is both backdrop and scenery. By hiding the ends and top of the building, its shallow depth isn’t apparent. As scenery, the visual textures of the brickwork and loading doors hold the eye and as the backdrop, the building directs it back to the foreground. The corner of a second building along with an enclosed overhead conveyor screens the entry point to the scene and adds a sense of depth. One has to peek around that corner to see what’s back there. A work in progress (WIP). The warehouse is too big to fit on my bench, so I built it in two sections that will be joined once the detailing and rough handling are done. The two structures suggest this is a busy, congested part of town. The streets are narrow and their different surfaces add to the timeline inferred by old and new materials. The blank fascia panel serves an important role. It frames the scene and also the second building, leaving its overall size to the imagination. Some might have left the front open and modeled the interior but I felt that would be too busy. Instead, this non-descript blank expanse directs your gaze back to the modeling by providing a visual resting place. Furthermore, as you can see in the opening photo, this corner also screens 50% of the scene when viewed from this end. As one moves toward the opening, the rest is gradually revealed, which increases the sense of surprise. The empty lot in the foreground gives breathing room and a bit of nature in the midst of the urban density. As I mentioned last time, the shape of the viewing window was carefully considered. Leaving two sides open creates more photo angles and viewpoints. A viewer can look down the street in addition to the typical broadside view. I modified the height from my original design in order to lower the built-in light fixture to better illuminate the front of the freight cars. In retrospect, I could have made the window shorter without losing reach-in access. Looking down North E Street gives a different perspective from the broadside view we’re used to seeing. The piece of white card is a partial mockup of the second building. At only 15” deep, the module is shallow, which is a deliberate choice. Even with quarter-inch scale, more depth wouldn’t contribute anything except excess weight and construction. More importantly, the shallow depth helps viewers focus on what is here and takes full advantage of the detail and presence of quarter-inch scale modeling. The buildings tower over your head as they should and in viewing the scene, you have a sense of being there. Coming details like utility poles will add another vertical element that breaks up the sight lines of an otherwise flat landscape and the layering effect they bring implies more depth than is actually there. An argument against designs like this is the alleged lack of operating interest. In plan view, four feet of plain track looks banal and the suggestion to add more track or modules is quickly given. A lesson I learned the hard way is not to overcrowd things in this scale. In a space this modest, more track would destroy the realism of the scene. One can certainly add another module but I’m resisting the urge for now. Fed by a simple staging cassette, I have everything I need with this scene. My focus is on what happens at this siding. Each loading door is a separate car spot, making operations more interesting that a first glance would suggest. With a cameo layout, staging is essential and I consider it more important than additional scenery. Instead of connecting another cameo module directly, I would insert a fiddle yard in between, to integrate staging at multiple points rather than just on one end. Painted black and partially screened, this section would visually disappear. I could hold a train here for a period of time to suggest greater distance or swap cars to imply other switching has occurred off-stage. It would serve as off scene destinations and as car spots for switching. A track level of 53-54” high is best for me. This is high enough to appreciate the details and offers good reach-in access when needed. The 15” depth is wonderful. Thanks to the shadow box style framing, the scenes look complete and the lack of depth isn’t apparent at all. Built-in lighting is the way to go in my view. With the many options in LED products now available, I can place light almost anywhere I need it. I used just one 24” high-intensity LED strip light that provides 2000 lumens, which is a lot of light. (Other strips I considered only offered 600-800 lumens.) I placed this strip about 18” above the surface and it’s like sunlight on the modeling. The ceiling mounted lights of a regular layout would be much farther away and wouldn’t produce the same amount of coverage per fixture. Integrated lighting also goes wherever the layout goes. 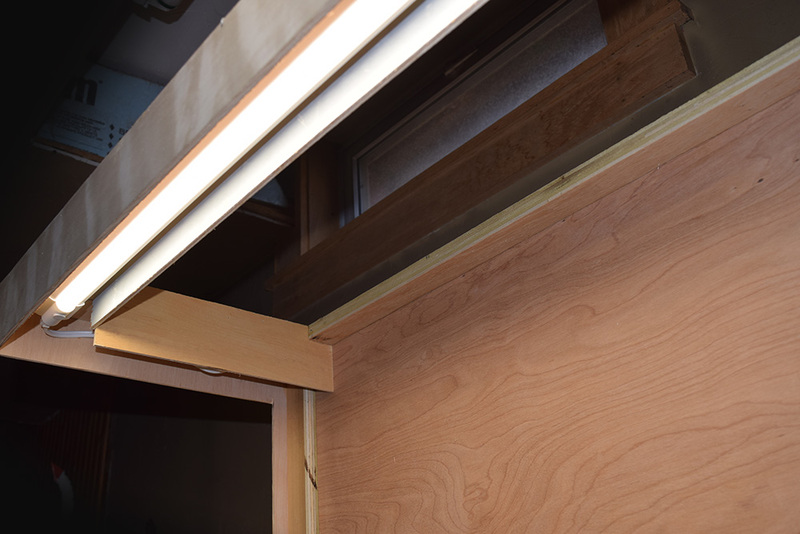 A high intensity LED strip light is built-in to the structure. I took care to screen the light from the front and back of the layout. A cameo layout like this offers the potential to have an operating layout using a larger scale in smaller, non-traditional spaces; something readers in the UK and elsewhere have known for decades. An eight to ten foot long wall can be found in many places and with thoughtful presentation a finished layout doesn’t have to be an ugly intrusion to a room. A self-contained cameo can be integrated into furniture grade cabinetry that includes storage for rolling stock. Such ideas are only limited by your imagination. This obviously won’t suit every taste. The paradigm of open country running with multiple town sites is deeply entrenched and if that’s your objective, this approach isn’t for you. One needs to be clear about what’s truly important and satisfying about the craft. This is my choice after many years of soul searching and it’s proving to be a good one. Speaking of those cars, with the bigger scale and eye-level presentation, you could really enjoy watching sprung trucks warping their way down uneven track. It’s more than watching the bigger picture of a train placing a car and now watching each careful foot step. Each time, investing in the relationship being built with this moment. I like the way that you’ve opened the end of the cameo as well as the front. What are you doing with the other end? Good question. I’ll explain further in the next post. Interesting ideas Chris. You’re right, it’s an opportunity waiting to be explored.